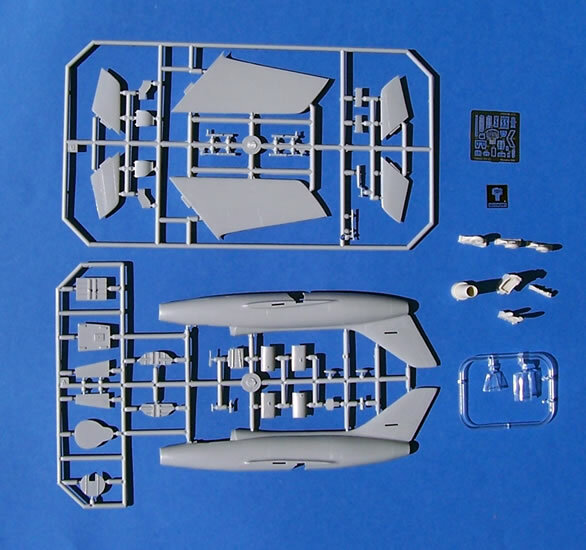 All three kits have forty grey and four clear styrene parts, between seven and nine resin parts, and one PE fret of thirty-three parts. 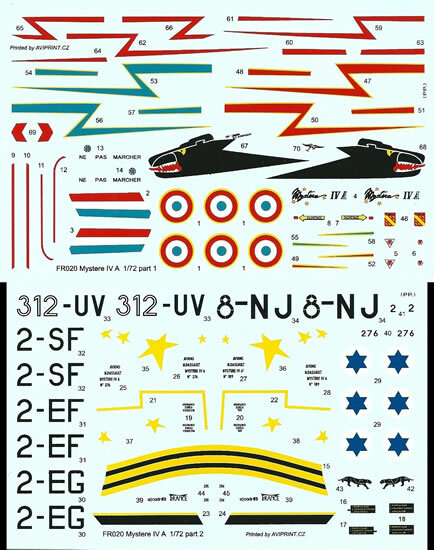 FR020 has decals for five aircraft with eight options overall, whilst FR021 & FR022 each cover three choices of aircraft. Good decals and choice of colour schemes, fine surface detail, nice clear parts, simple to build. There is no SNCASO E95 ejection seat option provided, and drop tanks are not included either. These are good quality limited-run kits of a rather overlooked subject, and so they are most welcome. It seems clear that FRROM spent some time selecting and researching the colour schemes offered with each boxing, with some nice options chosen. The decals appear to be of excellent quality. 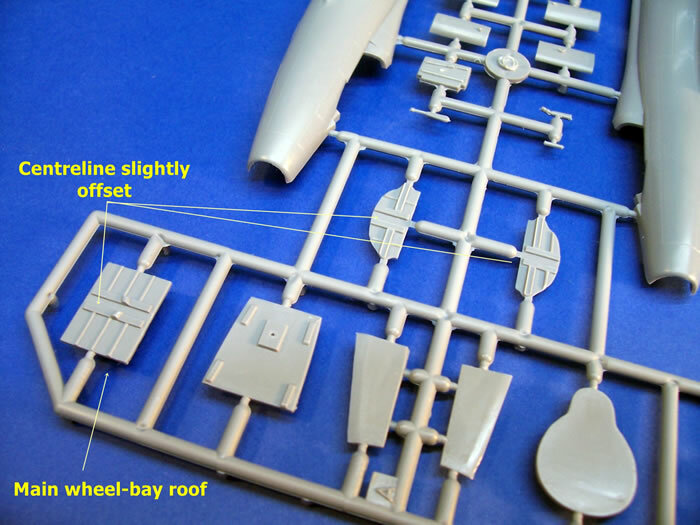 The quality of moulding is good for a limited-run kit, with refined surface detail and little flash. There is a nice cockpit with good clear parts. 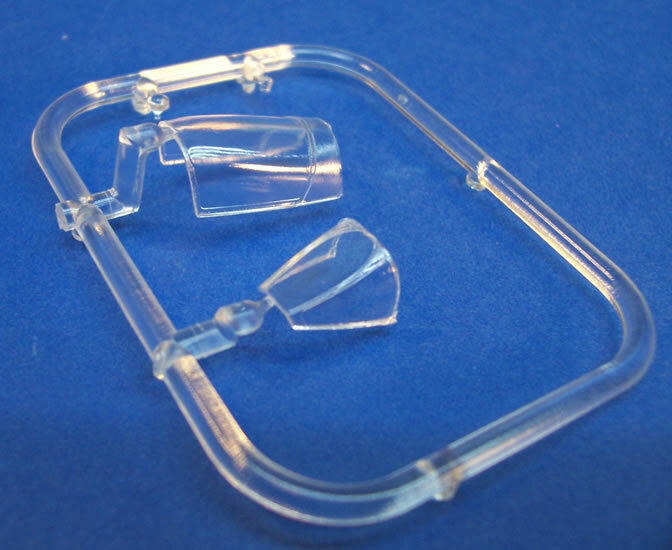 The kit makes sensible use of resin and PE for parts that limited run injection moulding struggles to do well. A rush to get to market led an oversight in proof reading; and so incorrect instructions concerning the horizontal stabiliser and Indian fin flash orientation were published. Both of these mistakes are very easy to remedy. My only real gripes are the lack of a SNCASO E95 ejection seat option, and that drop tanks should have been included with the kits. My gripes aside, these are nicely executed, simple kits with good levels of detail and very nice decal options. They should be enjoyable to build and result in very appealing models. I highly recommend all three. The Ouragan (Hurricane) was the first of a long line of French jet fighters built by the Société des Avions Marcel Dassault. Design work commenced just after the end of WW2 in 1946, whilst its entry into service was a short time later in 1952. The next design, the Mystère II, was an evolution of the straight winged Ouragan. It had a 30° swept wing as well as modified tail surfaces, and entered service in the Armée de l’Air in the spring of 1955. The Mystère IV was based on further refinement of the Mystère II design concept. It bore an external resemblance to the earlier plane, but it had a revised wing structure that was also strengthened. The Mystère IV prototype first flew on 28th September 1952; the pilot on this occasion being Constantin Rozanoff. The prototype proved to be a great success; so much so, that the Armée de l’Air ordered the first batch in October 1952. Eleven pre-production airframes were soon followed by the production version. This was the Mystère IVA, of which 411 were built. The first 50 aircraft had the Rolls Royce Tay 250 turbojet, whilst the remainder used the slightly more powerful Hispano-Suiza Verdon 350; which was a licence built version of the Tay. A US military mission chose the Mystère IVA for a production run that the USA would pay for. This military aid helped the USA’s allies equip with modern aircraft in the austere post-war years. In the Mystère IVA’s case it funded the production of a further 225 aircraft for the Armée de l’Air . The first unit of the Armée de l’Air to receive a production aircraft was the 12 éme Escadre, based in Cambrai. This happened on 25th May 1955. The new fighter also served with 2 éme, 5 éme, 7 éme, 8 éme and 10 éme Escadres; and it went on to have quite a long career in the Armée de l’Air. The Patrouille Acrobatique de Cambrai and the Patrouille de France air display teams both flew the Mystère IVA. It was the national team’s aircraft from 1957 until 1963. The Armée de l’Air flew the Mystère IVA on operations during the Suez crisis. This covered the last days of October and first days of November in 1956. Escadrille 1/2 "Cigognes" was a Mystère unit that was based in Dijon-Longvic. It deployed to Ramat-David airbase in Israel because of the crisis; here its aircraft had Israeli markings applied for reasons of subterfuge. The Israelis flew their own Mystère IVA’s during the crisis as well, and these scored some victories against Egyptian aircraft over the few days combat lasted. After its withdrawal from first line units, the Mystère IVA was employed in 8 éme Escadre at Cazeaux for advanced training. From November 1982, the Aphajet took over this role in place of the Mystère, which was to be retired from service. As well as serving the Armée de l’Air , France exported Mystère IVA’s to India and Israel; selling 110 to the former and 61 to the latter. This followed on from the success of the Ouragan that was already in service with these nations. Both used their Mystère IVA’s in combat; India flew them in its wars with Pakistan (1965 & 1971), whilst Israel did so against their Arab adversaries in two wars (1956 & 1967). Israel placed its first order for 24 Mystère IVA’s in December 1955; which was soon followed by an order for 37 more in April 1956. 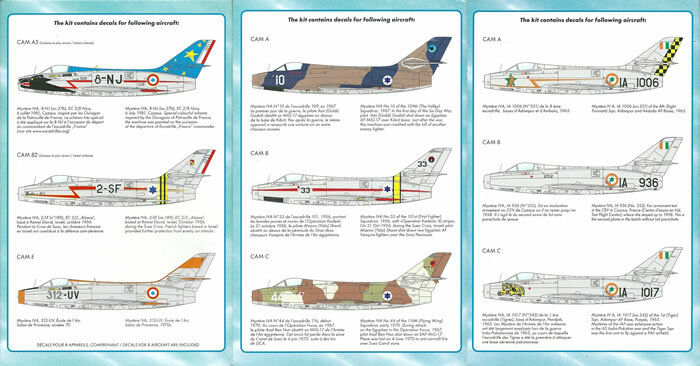 The first six aircraft landed in Israel on 11 April 1956, and commenced service with the Israeli air force at Tayeset 101 (Hatzor airbase). During the Suez Crisis they shot down an Egyptian MiG-15 on October 30th, followed the next day by four Vampires and two more MiGs. The Mystère flown by the leader of Tayeset 101, Benjamin Peled, was lost to Egyptian AA fire on the 2nd of November. 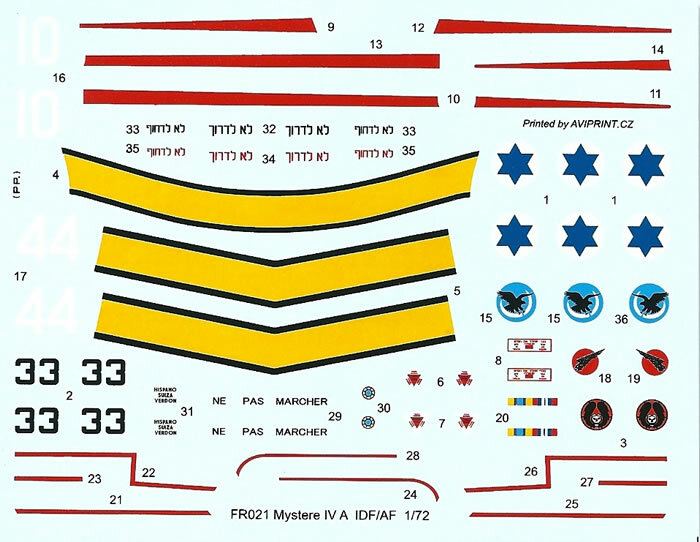 During the crisis French Mystère units, EC 1/2 “Cigognes” and EC 3/2 “Alsace“ were sent to Ramat David airfield to protect Israeli towns (See kit: AZUR-FRROM FR020). Later on in their service lives Israeli Mystères switched to the ground-attack role and fought in the 1967 war. The Mystère IVA began its service with the Indian Air Force in 1957. They first saw action during the 1965 war with Pakistan; and on September 7th, a Mystère destroyed an F-104 Starfighter during a raid on Sargoda. The Indian pilot, named Devayya, was awarded the Maha Vir Chakra for this action. Nine days later a Mystère scored another victory by shooting down a Pakistani L-19. Mystères also destroyed several Pakistani planes on the ground during the brief war; these included four F-86’s, three F-104’s and two C-130’s. The Indian Mystères changed from the fighter to ground attack role shortly after the 1965 war, and they flew in this role during the 1971 war. However, by 1973 none remained in service. 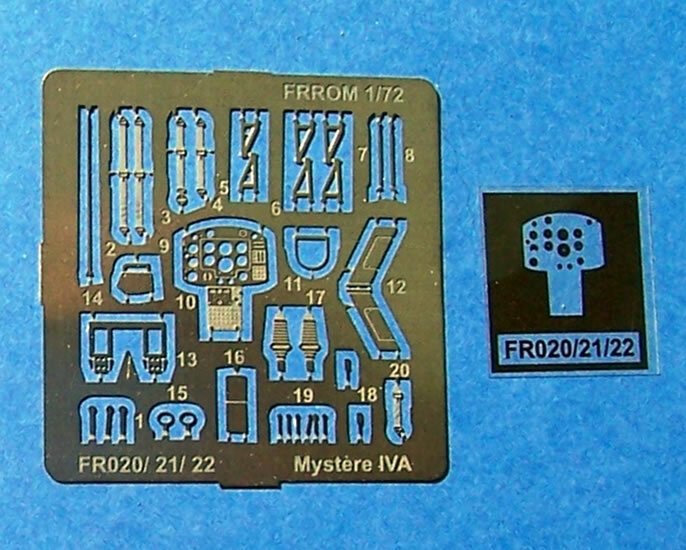 Mystère IVA kits have been thin on the ground, the best-known being by Matchbox and re-boxed by Revell. This is a very basic injected kit with crude detail. Graphy Air issued a quite nice resin kit with PE details about 12 years ago; Pettitjean also offered a resin kit about which I know nothing. 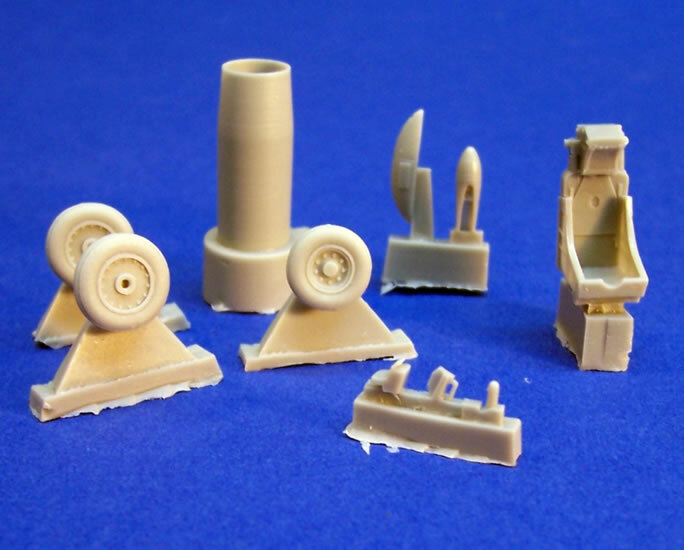 I am also aware of two vac-forms by O’Neill Vacforms and Rudel, plus a 1/75-scale kit by New Maquettes, but again I know nothing else about them. Whichever way you look at it, we modellers are well overdue a modern 1/72-scale injected kit of this worthy French subject. The kits come in end-opening boxes with very attractive artwork on their fronts. The instructions have a parts map and use easy to follow assembly diagrams. These are well drawn, and have colour call-outs cross-referenced to the Gunze Sangyo paint range. There is also a brief history of the aircraft and its service. All text is in English and French. The painting and decal guide consists of shaded drawings and full colour profiles on the reverse side of the boxes. A resealable polythene bag encloses the parts and decals, whilst the transparencies, resin parts, decals and PE fret come in small bags of their own. 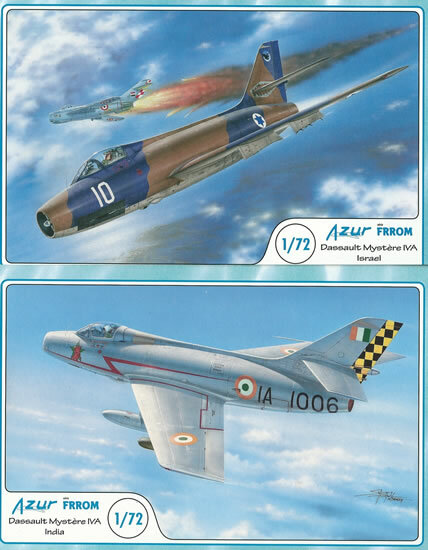 The painting and decaling guides and box-art of the Indian boxing, FR022, shows all aircraft with their fin flashes reversed. The sequence of orange-white-green leading to trailing edge is incorrect for the Indian Air Force; but it is correct for their Mystères when delivered because Dassault got it wrong! The fin flashes were soon corrected to run green-white-orange leading to trailing edge. It is obviously a simple matter to reverse the decals provided with the kit. 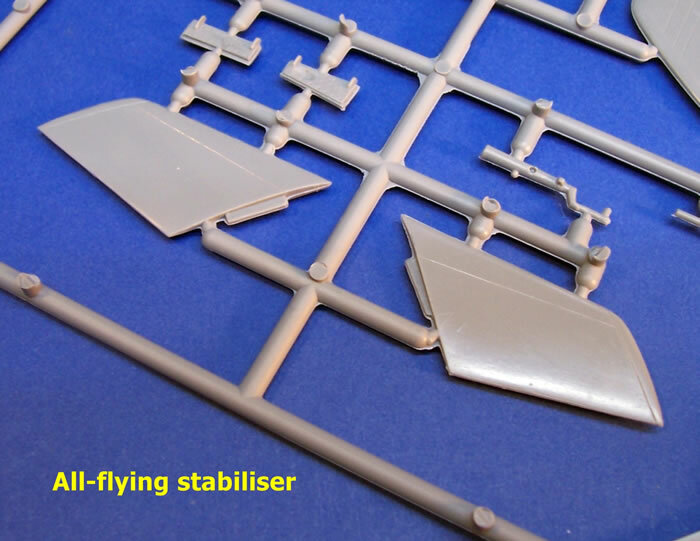 The kits come with two styles of horizontal stabiliser. 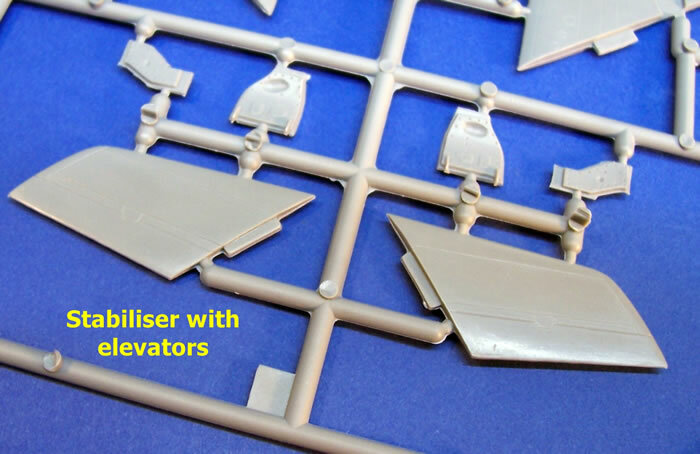 Their instructions show the all-flying stabiliser crossed out in the parts map and direct the use of the one with elevators. This is incorrect for most of the aircraft covered by the kits. It was the first 147 airframes that used the stabiliser with elevators; and many of these had the all-flying type retrofitted. So unless your references indicate otherwise, use the crossed-out all-flying stabiliser parts. 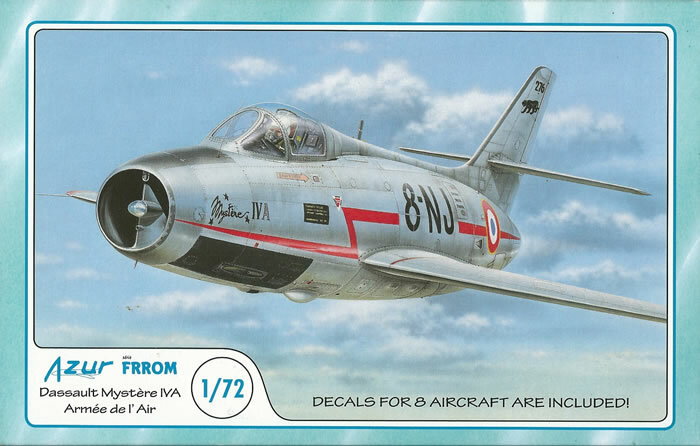 Of the three boxing reviewed here most should use the later style all-flying type, with the possible exception of one French aircraft, 312-UV, in box FR020. 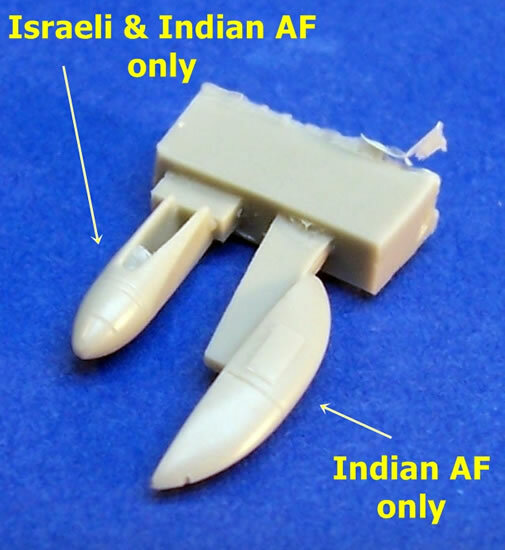 FRROM advised that all of the Indian aircraft had the later style, and that research is ongoing regarding the fit of Israeli planes. The outcomes of further research will appear on the FRROM website in due course. The kit comes with only one type of ejection seat, a Martin Baker YAM-4. Belatedly, FRROM realised that this seat replaced the Mystere IVA’s original SNCASO E95 seat after 1967. It is clear that the kit should have come with both types of seat to cover pre-’67 aircraft. Aeroclub did offer a SNCASO E95 in their white metal seat range, and with luck, perhaps Pavla or some other resin accessory company will come to the rescue. The type of seat fitted to Indian aircraft is unclear to me at the time of writing, although I have been advised that the Israelis replaced the original French seats with MB4’s later in the aircraft’s service life. The lack of an E95 seat is disappointing, but may not apply to the aircraft you wish to model, so check your references. I would also welcome any advice readers may have on Mystère seats, so please contact me if you do have something to share. Some Mystère IVA’s have a NACA ducts in the fuselage just behind the trailing edge of the wing and slightly above the wing-root. The Artwork for the Indian boxing illustrates this well, just look inside the roundel. The ducts are associated with e Verdon engine, so again, check references. These ducts can be difficult to carve out, but homemade decals or painted-on ducts can work reasonably well in this scale. There is no pitot tube for the starboard wingtip, but this is an easy fix as it is a simple tubular affair. Although there are three boxings, I will generally refer to the kit, as all boxings have the same contents other than a couple of resin part variations. 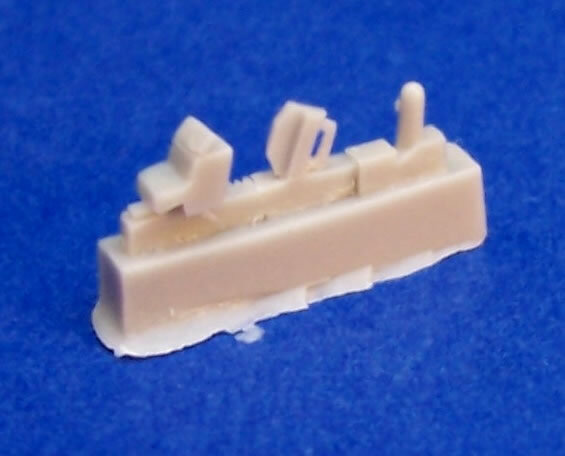 The kit is a nice limited-run moulding by the MPM-Group. Its quality is the same as their Azur and Special Hobby brands, with which many will be familiar. The sprue gates are narrow and little flash is evident. 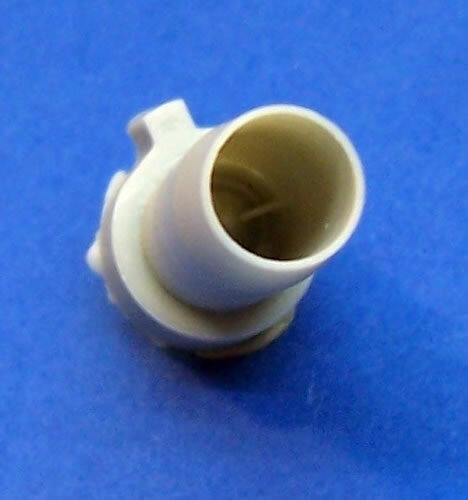 The parts break down is conventional for the type. Panel line detail is fine and restrained, and thankfully not covered in rivets. The cannon troughs are a little shallow because of the limited-rum mould engineering, but they should look okay drilled out and with some false shadow painted in. The canopy is quite clear and acceptably thin. The small PE fret looks fine, and the resin is nicely cast. The decals have sharp registration and good colour density. Cockpit detail is good for the scale, and uses a combination of styrene, resin and PE. 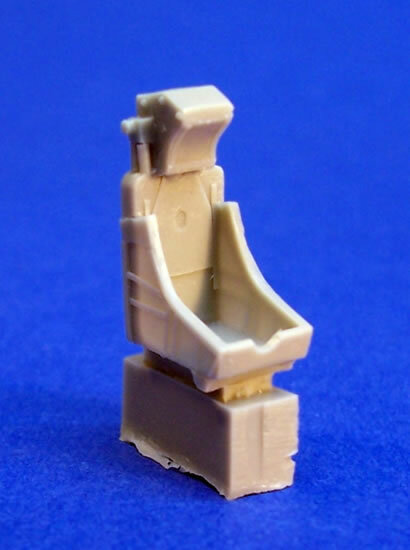 The resin seat has PE belts, although these are not pre-coloured, a firing ring, and footrests, also all PE parts. The PE instrument panel uses a film for the instruments. Various PE levers and a resin gun-sight top things off. There is internal ducting for the air intake that ends against the cockpit bulkhead. Provided the bulkhead is painted matt black, I think that this should look effective enough. The main wheel bay consists of four panels. The panel dividing the wheel bay should run along the fuselage centreline, but where this panel aligns with the bulkheads and bay roof seems off centre by about 2-mm. I was concerned about this until I checked a number of photos of Mystère IVA’s. It seems that the doors covering this area remain shut when on the ground, so the entire wheel bay will be barely visible. However, you still need to ensure that the dividing panel runs along the centreline, as the doors hinge off this part. The cockpit tub, main wheel bay, intake ducts, and resin exhaust nozzle are then enclosed within the fuselage. Being a limited run kit, it seems quite likely that some adjustment may be needed to get all of these sub-assemblies to sit right. I suspect that the intake ducts will be the most demanding, and may need a little thinning down. 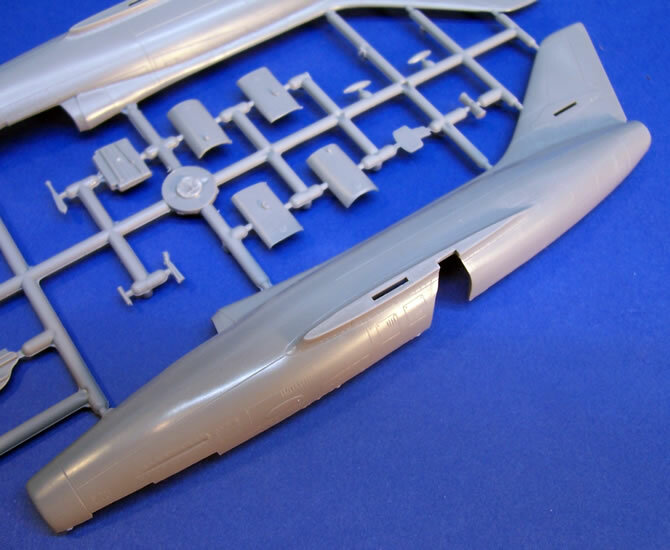 The wings and horizontal stabilisers are moulded as one-piece items that serve to simplify assembly; so you should have a complete airframe sitting in front of you quite quickly after starting to build. All that remains, aside from a few small details, is fitting the undercarriage. The undercarriage legs look fine, and are enhanced by PE scissors links, and topped off with nice resin wheels. The doors look quite good with some detail present on their internal faces. A nice two-piece canopy gives the option of an open or enclosed cockpit. 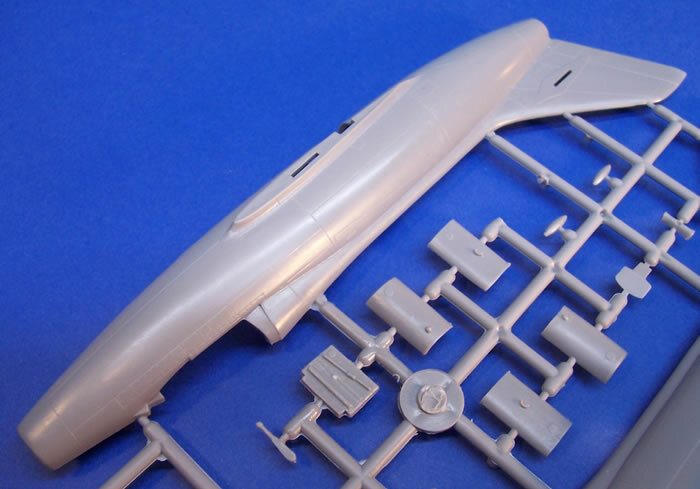 Also to fit are a PE whip aerial just ahead of the windscreen, a clear landing light into the intake splitter, a resin navigation on the tail fin, and two cannon breech bulges under the fuselage. Some of the Israeli and Indian options have a resin fairing for a braking chute that fits to the tailfin. The Indian kit also has a resin fairing under the rear fuselage that looks like a tail bumper but may have served some other function. 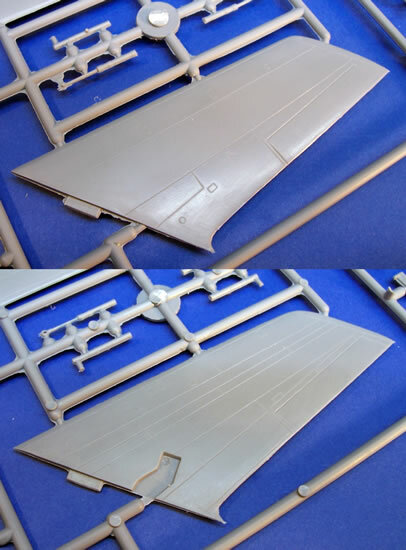 Two styles of PE blade antenna are also provided to fit on the fuselage spine, the style used being dependent on the option being modelled. No external fuel tanks or other underwing loads are provided; which seems quite an oversight in the case of drop-tanks, and a missed opportunity when it comes to ground attack payloads. I think that these kits should build quite easily and quickly, with no obvious pitfalls; but take care to locate correctly the main wheel bay centreline structure. FRROM has selected some attractive schemes for each of the three boxings. The small print in the painting and markings guide directs you to www.frrom.com to download the schemes in full colour; this is a nice touch, and is being added to the web-site at the time of writing. In all cases the decals look to be of very good quality, they are printed by Aviprint, so they should be. The French boxing has markings for five different aircraft with three additional options to cover different periods during their service. The Israeli and Indian boxings each have three options. FRROM’s painting guides list natural metal for several of the colour schemes. However, an article by Philippe Gourgues in Scale Aircraft Modelling Vol. 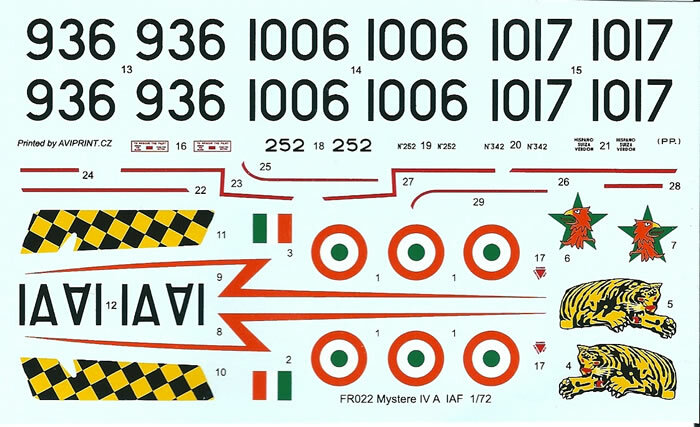 21 No12, advises that by the late 1960’s that the French Mystères were painted aluminium, and that most Israeli and Indian machines were painted aluminium upon delivery; so check your references. 8-NJ (No 276), EC 2/8 Nice, two variations for Cazaux in 1972, and one special scheme applied whilst in Nice in July 1981. 2-SF (No 189), EC 3/2 “Alsace”, based at Ramat David, Israel, and the same aircraft wearing Israeli roundels, as part of the fictitious 199 Squadron. Both schemes apply to the Suez Crisis, October 1956. 2-EF (No 205), EC 1/2 “Cigognes”, based at Ramat David, Israel, wearing Israeli roundels, as part of the fictitious 201Squadron during the Suez Crisis, October 1956. 2-EG (No 206), EC 1/2 “Cigognes”, based at Ramat David, Israel, during the Suez Crisis, October 1956. 312-UV, Ecole de l’Air, Salon de Provence, 1970’s. No 10, 109th (The Valley) Squadron, 1967 (Downed Egyptian MiG-17 during the 6-Day war, and another aircraft shortly after). No 33, 101st (First Fighter) Squadron, Operation Kadesh, 1956 (Downed two Egyptian Vampires). No 44, 116th (Flying Wing) Squadron, early 1970 (Downed an Egyptian MiG-17 during Operation Focus in 1967). -	IA 1006 (No 331), 8th Squadron, Adampur & Ambala Air Force Bases, 1965. -	IA 936 (No 252), Test Flight Centre (Centre d’Essais en Vol, or CEV), Cazaux, France. The aircraft was used for armament tests until its departure for India in 1958. -	IA 1017 (No 342), 1st (Tiger) Squadron, Adampur Air Force Base, Punjab, 1965 (This and other 1st Squadron aircraft saw extensive service in the Indo-Pakistani war of 1965). It seems clear that FRROM spent some time selecting the colour schemes offered with each boxing, with some nice options chosen. The box-art is most attractive; and whilst not essential, I think that nice packaging enhances the kit-buying and ownership experience. Down-loadable colour schemes are a great idea that only a few manufacturers exploit. The quality of moulding is good for a limited-run kit, with refined surface detail and I think just right for the scale. There is little flash and quality is consistent with the current Azur and Special Hobby practice. There is a nice cockpit with good clear parts to see it through. 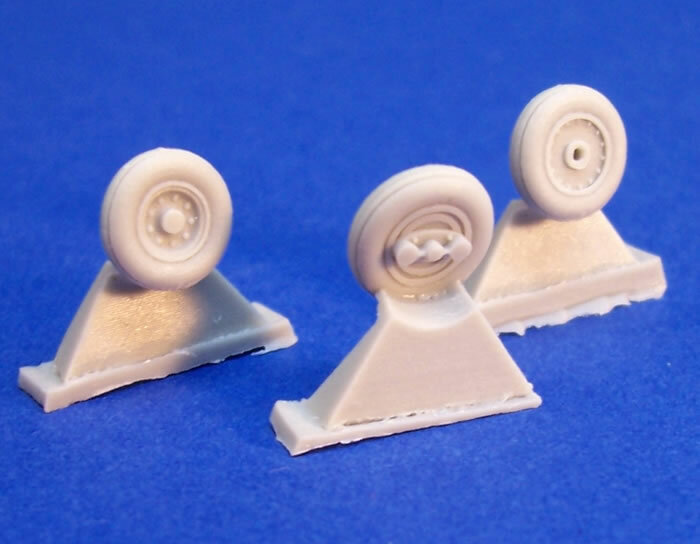 The kit makes sensible use of resin and PE for parts that limited run injection moulding struggles to do well; the resin wheels and jet exhaust being examples of this. Nevertheless, is not all praise. A rush to get to market led to some oversights in proof reading. Fortunately, the errors in the instructions are very easy to remedy once you area aware of them. In fairness, FRROM drew them to my attention for review purposes, and they will publish this advice on their new website in due course. When it comes to criticism, I am more concerned with the lack of a SNCASO E95 ejection seat option, and no drop tanks. Whilst both are significant oversights in my view, they certainly are not bad enough to ruin the kits. My gripes concerning the lack of an E-95 seat and drop tanks aside, these are nicely executed, simple kits with good levels of detail and nice decal options. They should be enjoyable to build and result in very nice finished models. I highly recommend all three. Thanks to FRROM for the review sample.